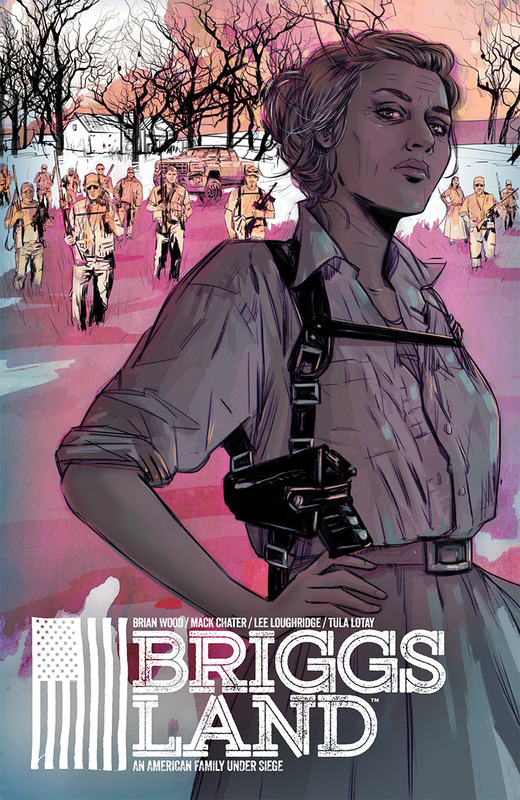 Dark Horse has announced Briggs Land from writer Brian Wood. The new comic series begins summer 2016, with interior artist Mack Chater, cover artist Tula Lotay, and Hugo Award–nominated colorist Lee Loughridge bringing Wood’s script to life on the page. Wood is also developing a television adaptation of the comic for AMC, serving as writer and executive producer, with producing partners John Hodges and Ravi Nandan at A24. In the release Wood said he and AMC had been looking for something to do together for years. Briggs Land is a crime drama set within a rural secessionist community. The series is the latest political comic for Wood who has tackled the topic in such series as DMZ, Rebels, and The Massive. The series tells the story of Briggs Land, nearly a hundred square miles of rural wilderness that harbors the largest and most secretive antigovernment secessionist movement in the United States. When matriarch Grace Briggs wrests control of the operation from her incarcerated husband, she sparks a war within the community—and her immediate family—that threatens to bring the full power of the federal government down on their heads. Briggs Land #1 is in stores August 17, 2016.